Its a cardinal sin if you meddle with a systematic futures trading system. So I hope the patron Saint of Traders will forgive me. There doesn't seem to be a patron saint of Traders, but St. Matthew is the patron saint of Bankers so that is close enough. 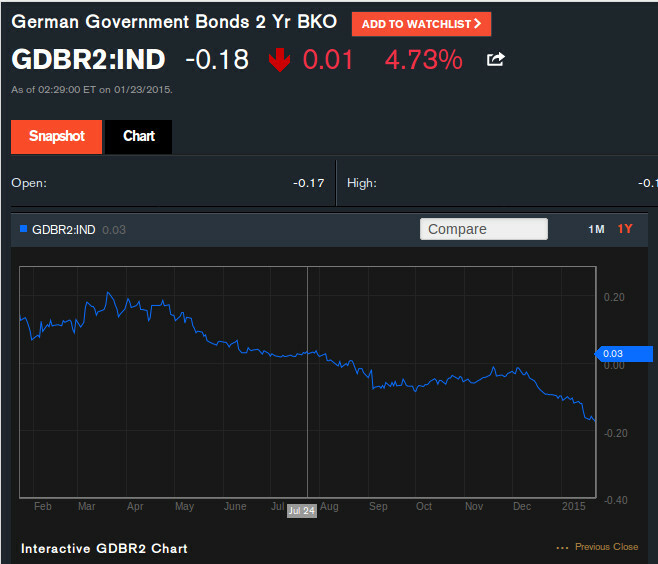 I'm going to stop trading 2 year german government bond futures (Shatz). There are two main reasons.It's basically a question of very high downside versus limited upside. Firstly the downside: volatility is very low, about 20 basis points a year movement on the yield. This compares to normal volatility in interest rates of about 100 basis points a year. Low vol means more leverage, and hence exposure to a Swiss Franc type episode. It feels to me like an asset with negative skew with a serious peso problem. It also means higher volatility adjusted trading costs. * There is a subtle difference between the benchmark yield and the effective yield on the Cheapest to Deliver bond on the future, but lets not worry about that today - its Friday. I'm extremely uncomfortable trading bonds when interest rates are negative or close to it. As systematic traders we rely on the future being like the past. There aren't enough periods of negative rates in the past to make me confident that my back-tested models will work. This isn't just a case of turning off all developed world interest rate trading models in a post 2011 ZIRP / QE enviroment. Its a problem that's specific to Germany (and Japan, Switzerland and Denmark; but I don't trade bond or STIR futures there). Contrast the Shatz to the US two year future. US two year yields are a reasonably healthy 50bp and volatility is around three times what it is on the Shatz. I have no hard and fast rules about where the threshold is between 'models work' and 'models not working'. For now at least I'm going to keep trading the German 5 year Bobl future. Although five year rates are around zero the volatility is a slightly more sane 35bp, so my exposure to a black swan event is more limited. If the 5 year rate goes below minus 10bp, or the volatility drops below 25bp (about 1 point a year in price terms), then the Bobl will be joining the Shatz in Room 101. Anyway I'll be reallocating my risk to both the 5 year and 10 year (Bund) futures. I don't trade 20 year Buxl as the risk is too chunky for my modest book. Of course QE will probably push prices up further (although it might be a case of buy the rumor, sell the fact? ), but I'll participate in the upside. It strikes me that the yield curve is unlikely to move parallel on the QE move. In Japan we saw curves flattening as rates approached zero, with yields out to a few years hitting zero and then a 'hockey stick' shape developing further out. So there should be more upside further out on the curve. This is all over thinking things somewhat, and I'd like to emphasise that this isn't a 'trade', I'm just trying to support what is for me at least a controversial decision. Whenever you make an intervention like this you should set some 'exit conditions. So if the Shatz volatility rises above 30bp and the yield above 25bp, then I'll be back in. I won't be selling out immediately, but I've started gradually reducing. I expect to be out well before when I would normally be ready to roll into the June 2015 futures. Hopefully there won't be a blow up before then! I'm going to do something potentially dangerous today, and write about politics. In a little under 4 months time we're going to have an election in the UK, and the campaigning has already started in earnest. Watching the main party leaders haranguaging each other, and us, about the deficit and the health service is somewhat depressing. I don't know much about politics, although I know a bit of economics, something that makes hearing these debates even more annoying. There are a few things I do feel comfortable with such as financial analysis, behavioural finance and IT project management. So I thought it would make complete sense to analyse the election using ideas from those fields. Politicans, ably assisted by the media, remind me of active fund managers producing performance statistics. They all manage to beat the benchmark. This makes it tough to work out which manager is best, and hides the real issue, which is that they all lost money. Similarly the lack of public understanding of economic issues makes it all to easy for our elected leaders to spin the numbers to suit their case, and ensure we don't focus on what is important. The government are spending roughly 45% of GDP versus revenue of 40% of GDP, a net deficit of 5% of GDP. We currently owe about 70% of our GDP (public sector net debt, rather than the gross figure usually quoted). This is the highest figure achieved except after major wars. I'd bet you'd struggle to find many members of the public who know those figures. This is a real pity because it makes it very easy for politicians to treat us like children. We know that times are tough at home because Daddy has lost his job, but we don't know exactly how good or bad our financial situation is. So when Mummy and Daddy argue about what the best solution is to the problem, its difficult to know whose right because we're not even sure what the problem is exactly. I guess they think we are too stupid to understand. One of the main findings of behavioural finance is that people are woefully overconfident. This is a real problem when people are making decisions about large amounts of client money, such as in huge hedge funds like the one I used to work for. Politicians are keen to slag off idiots in the banking and investment industries, but they are also people making decisions about even larger amounts of other peoples money. At least hedge fund managers are regulated, and many have some kind of training or education to do their jobs, unlike politicans. Take the issue with the deficit above. There are only five ways to deal with this. So we can eithier move the budget into surplus by options 1,2 and 3; or directly cut our outstanding debt with options 4 and 5. Leaving aside the final option, which is not really an option for an economy like ours, we've got four possibilities. Unfortunately option three is a difficult one since governments don't really know how to make this happen. They can do supply side stuff, but most government impact on growth will come from the secondary effects of options one and two, making the problem even less tractable. Option four also seems to be off the table. The Bank of England can't currently produce 2% inflation, never mind the 5% that would get the deficit down to manageable levels relatively easily. I have some ideas that would help but this isn't the place to talk about unconventional monetary policy, and if the public can't be trusted to grasp simple accounting identities about government borrowing then IS/LM models and RBC calibration are probably a bit esoteric for the front cover of a tabloid. This leaves us with options one and two. Unfortunately economists can't agree or don't know which of these is correct. Yet if you listen to the political debate you would think that the main party leaders had a hotline to some hietherto unknown economic guru who has all the answers. They talk as if they are completlely sure that their preferred way is correct, and the other way is economic madness. This is overconfidence of the highest order. I'm reminded of people whose portfolios are wholly undiversified and who refuse to countenance any suggestion that this is a bad idea, and maybe they should buy just a few bonds to hedge themselves a little. If you've worked in the corporate world you will know the dangers of the big IT project well. Someone senior will look at your current sticky taped together mess of legacy systems and declare that the whole lot needs rewriting. A project spec is produced showing the whole thing will take a year. A highly paid project manager is brought in. The huddled mass of existing programmers, who have been bravely keeping the show on the road for years with no budget, are augmented by a team of over paid consultants and permanent newly hired whizzkids. The whole enterprise is doomed from the start but spec creep and user interface over-design always make it worse. If the organisation is brave enough, or run out of money, they will cancel it after two years and swallow the sunk cost. If not then after five years something vaguely useable will appear. In the first year nobody will know how to use it, preferring the old system. When the old stuff is turned off there will be another year, at least, of chaos. Eventually everyone will get used to it. However all the patches that have been required to make it work will mean it looks like a horrible mess, and the cycle will begin again. It is massive overconfidence of the highest order to assume you can completely build new complex systems without something going wrong, in relatively short periods of time, without causing chaos. Yet this is exactly what the government does every time it decides to reorganise the NHS, the education system, the military etc. They decide the whole thing is a bit rubbish, fragmented, inefficient and decide to replace it with a new shiny NHS. The rest of the story is exactly the same, except that there is also the possibility that another government will come in and cancel the project after five years; only to replace it with their own version. Often ironically this process involves the installation of a massive computer system, so we get both the digital and the analogue version of this story running in parallel. The failures of large government computer system projects are well known, but nobody has drawn the logical conclusion that this is just a symptom of the underlying problem. New governments trying to rewrite the software of a large mixed economy every five years are doomed to failure. Bad change is worse than a bad system. People are remarkably good at working with bad systems and making them work. In the Soviet Union a parallel economy existed where factory managers bartered goods to keep things going, completely bypassing the creaking machinery of state planning. Things only disintegrated when the system was replaced overnight by crony capitalism. The continous revolution that people working in the education and health sectors, to name but two, is much worse than if we'd left an apparently poor system alone and let people make it work. If I ruled the UK - strictly as a figurehead with elected political leaders below me of course - I would take the following steps. 1) I'd close the office for budget responsibility, and use the money saved to beef up the funding of the Institute of Fiscal Studies. Both these organisations provide a sort of independent economic audit of the governments finances. But the former, run by a former IFS head, is seen as too close to the government to be independent. The IFS funding would become ringfenced so it couldn't be influenced by future governments. In return the IFS would have to do a lot more public outreach explaining and interpreting the economic numbers to an audience beyond who they reach now. I'd like to see the director of the IFS writing columns in the Sun and the Mirror. 2) I'd force all politicians to adopt diversified portfolios. I've no idea whether tax cuts or revenue raising is best. I don't want any future party experimenting to find out. Let's limit the maximum amount of deficit that can be closed by one method or the other to 65%, with a minimum of 35% coming from the other element. With the IFS educating the public we can then take a more informed choice of which is best, but at least if we get it wrong the consequences will be less extreme. Let the ideological difference come down to which spending we cut or tax we raise, rather than by how much. 3) Finally the government would have to adopt an agile methodology to all system changes, using the method the best software development teams have used for many years. This means doing things in small bite sized chunks rather than doing a massive change to the entire system. In case its not clear I'm talking about all changes to the state machinery, not just computer software. The overall project plans for any change expected to last longer than 5 years would have to be agreed by cross party support and then frozen so they can't be messed with by the next government. I think thats enough for one post. Next week I'll solve world peace.